«Kubangidroizolyatsiya» LLC was founded in 2001. The enterprise is a producer of waterproofing and heat-insulation materials under the united trade mark SUHO. The production base of the enterprise is located on a private plot of land and includes: production buildings, a testing laboratory, administration and living quarters, as well as warehouses for raw materials and finished products. All SUHO materials were created by the specialist in-house design team of «Kubangidroizolyatsiya» LLC. The principle distinctive feature of SUHO materials is operational versatility and simplicity. Anyone making renovations can use SUHO materials independently, without having to use the services of a company specialising in waterproofing and thermal insulation. The motto of the company being - «You can do it yourself!». SUHO materials are non-harmful, non-flammable and chiefly meant for internal works. It provides waterproofing and thermal insulation not only of a structure as a whole, but also of its separate units and areas. The Russian Federation was created and successfully operates a system of trade representative offices "Kubangidroizolyatsiya." Opened an office in the European Union: SRO «Bering Servis», Hradec Kralove, Czech Republic. The high quality of SUHO materials and the conformity of their properties and characteristics with said parameters have been proved by numerous tests in research centres of the Russian Federation. 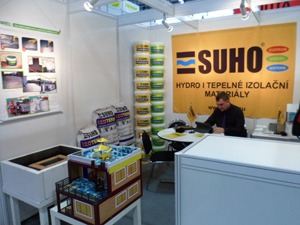 Certificates obtained from the Federal Agency of Technical Regulating and Metrology, the Federal Agency for Construction, Housing Maintenance and Utilities and the Russian Agency for Health and Consumer Rights permit the usage of SUHO materials in the process of designing and constructing buildings and structures of industrial and civil nature. Accredited by the European Union, the Building Research Institute-Certification Company, ltd (Prague, the Czech Republic) has performed complete testing of represented SUHO materials. In view of the research results, the Institute has not only granted a certificate and permit for realisation of SUHO materials in outlet chains in the countries of the European Union, but also recommended them for usage in the process of executing project, construction and repair works. «Kubangidroizolyatsiya» LLC is a frequent participant and award winner of international and regional construction exhibitions. 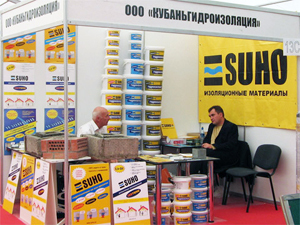 Our company Kubangidroizolyatsiya successfully cooperates with the world leaders in the field of trade with waterproofing, insulation and insulation materials, such as a global network of Leroy Merlin, and much Baucentr drugoe.Kompaniya participates and has numerous awards from international and regional shows in the construction industry. 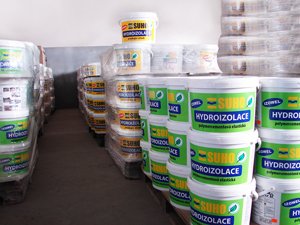 Sale of waterproofing, insulation and thermal insulation materials under the brand name of a new generation SUHO. The system of trade representative offices of «Kubangidroizolyatsiya» LLC has been created and functions successfully on the territory of the Russian Federation. There is also a representative office within the European Union. Оставить свой отзыв вы можете на оффициальной странице организации SUHO (en), расположенной на информационном ресурсе open-krasnodar.ru. Перейти на страницу.